In August of 2017, a freak-flood in Northern Bangladesh arrived in the middle of the night, forcing Mr. Kachu, his wife, and four children to leave with just a few household possessions. Unfortunately for Mr. Kachu this nightmare was about to get much worse. Without telling his father, Mr. Kachu’s youngest son ‘Mo’ (aged 9) decided to attempt to cross a rapidly widening river to retrieve his schoolbooks that had been left behind in the shelter. 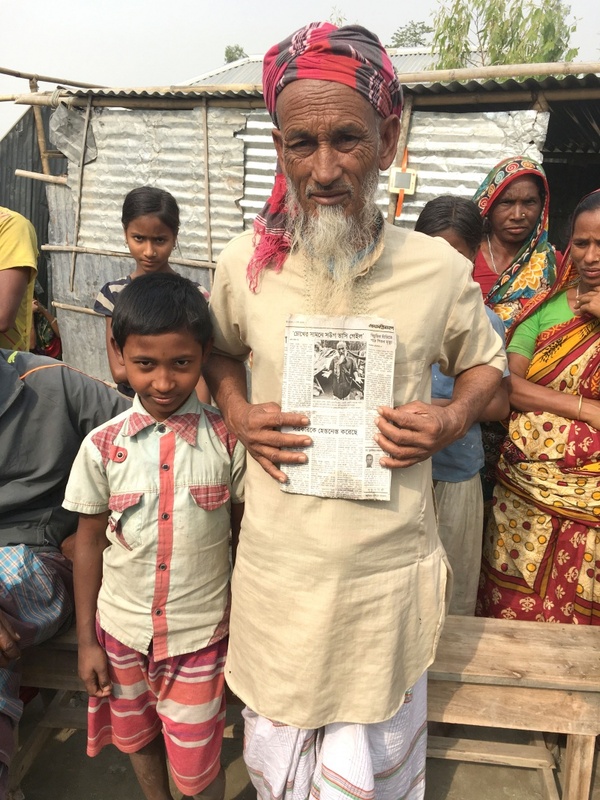 For four days, Mr. Kachu thought he had lost his son forever, until a phone call from his sister informed him that Mo was safe and sound in a neighbouring village. Mo was washed away by the strong currents that had formed, but fortunately had managed to hold onto a large banana leaf that had kept him afloat. Mo had to endure this for 15km and was eventually forced into the shrubs of a neighbouring village where he was pulled out by the local community. Luckily Mo’s aunt lived in this village and the word of his ordeal soon reached her. She took Mo in until he was eventually reunited with his father. By the time Mo made it back to his father they had received ShelterBox aid, which had enabled Mr. Kachu to build a temporary shelter with the tarpaulins and keep his family warm at night with the blankets. Mr. Kachu has since been able to find land to build his permanent shelter, where he has used the tarpaulins to make a sturdy and waterproof roof. Mr. Kachu and his family are happy here, and now feel better prepared for this year’s floods. At first I thought I had lost everything, but now I have my son back and a home to protect my family, thank you.